Wow! 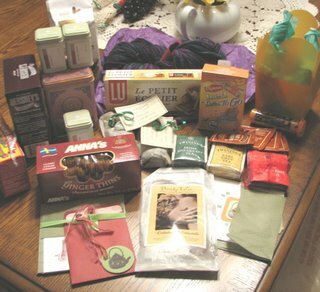 My Knitter’s Tea Swap 2 package arrived and it floored me! I was looking forward to having some new tea….try 12 kinds!! The list: Harney & Son’s Bangkok (the bags are like little pyramids and it smells incredible), Stash’s English Breakfast and Green Moroccan Mint, Twinings’ Earl Grey and Irish Breakfast, Bigelow Fruit and Almond, Tea on the Thames two large tea bags of Earl Greyer and Papaya, respectively, Adagio’s Candy Apple, Gingerbread, and Chestnut, and Lipton Iced Tea to Go. The treats included Schoolboy Cookies, Milano Cookies, M&M Minis, and Ginger Thins–all perfect! She included some Bath Tea (oooh!) and some handmade stationery. And, if that wasn’t enough, some goodies for Amelia: Animal Crackers, cocoa and a little pink bunny (already taken by the recipient). The yarn is Mountain Colors (which I’ve been wanting to try) in a gorgeous colorway. I love it all! Thanks, Lisa of Rhode Island! Wow – you are very lucky to have such a great pal. I’m so glad you are happy with it and that it arrived safely. Since I mailed it so early (I’m usually a last minute type of person), I kept thinking I had forgotten something. Oooh – what a lovely swap package! So thoughtful to include gifts for your daughter. I am looking forward to getting to know you during the upcoming months. Whoa! The first SP9 sighting! Yay!